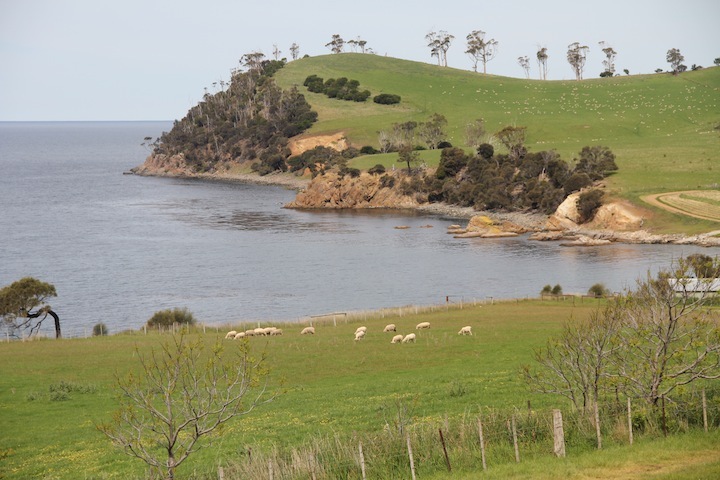 The Bruny Island Slowjourn (Slowfood Hobart) that took place during October this year (2011), has once more highlighted the fact that Bruny Island has become synonymous with some fine local foods and resourceful local producers. 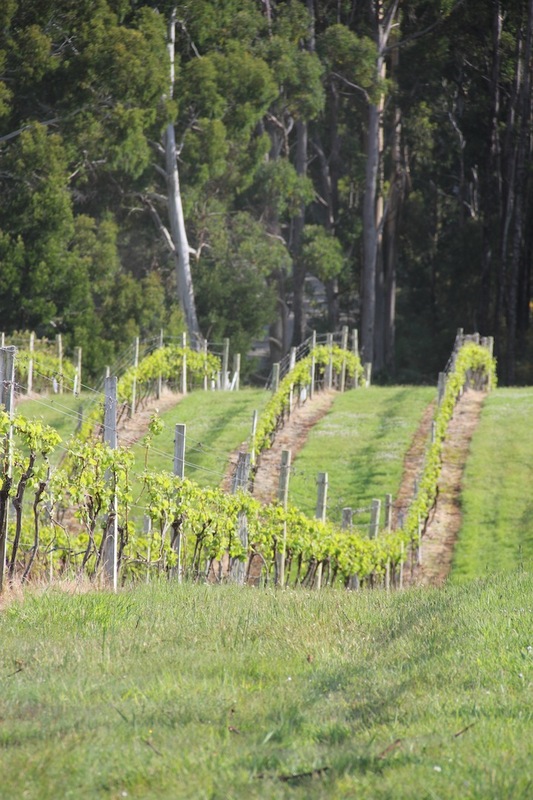 This page is dedicated to just some of the produce and the producers of Bruny. 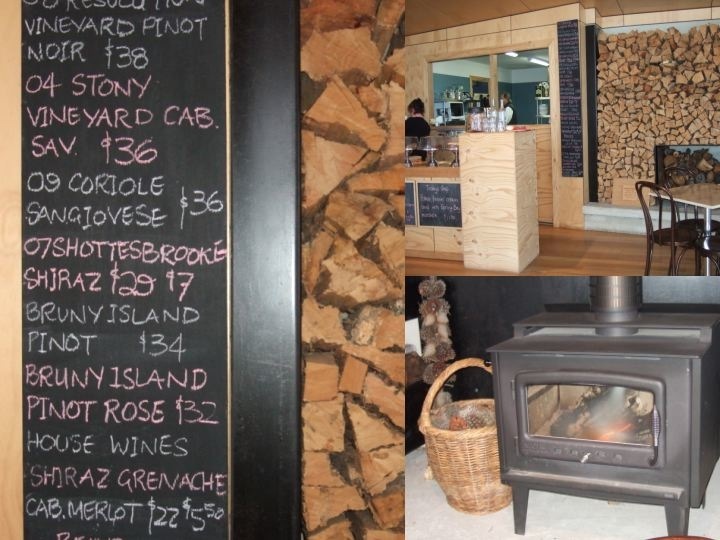 Whilst the Jetty Cafe at Dennes Point is not where it all started, it nevertheless stands for much of what Bruny gourmet food is all about. 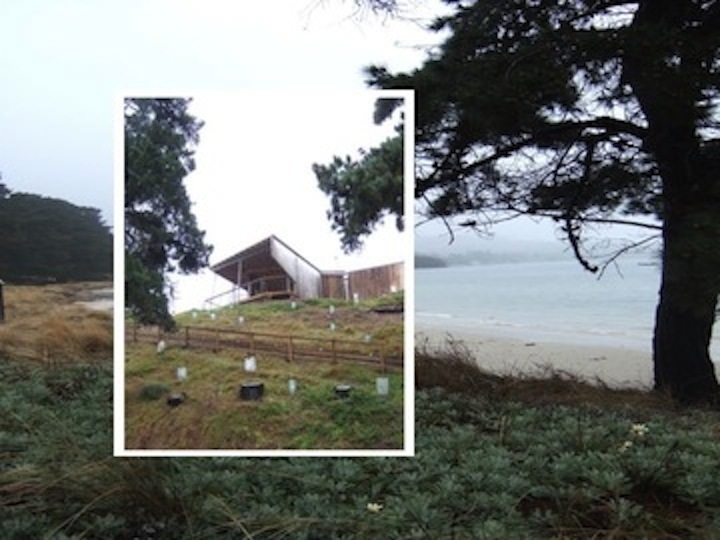 Down at Dennes Point, the Jetty Cafe, General Store and Art Gallery are all part of a unique community project. The buildings were designed by John Wardle (an islander shackie) and Associates, and built with voluntary labour from the community itself. Chef Ray Jones, at Jetty Cafe is keen to use local produce, reduce food miles and support local businesses, and he has one helluva library of cook books which can be read over a good coffee. His menu includes dishes sourced from local resources – the slow braised lamb for example, comes from nearby Murrayfield at Trumpeter Bay. 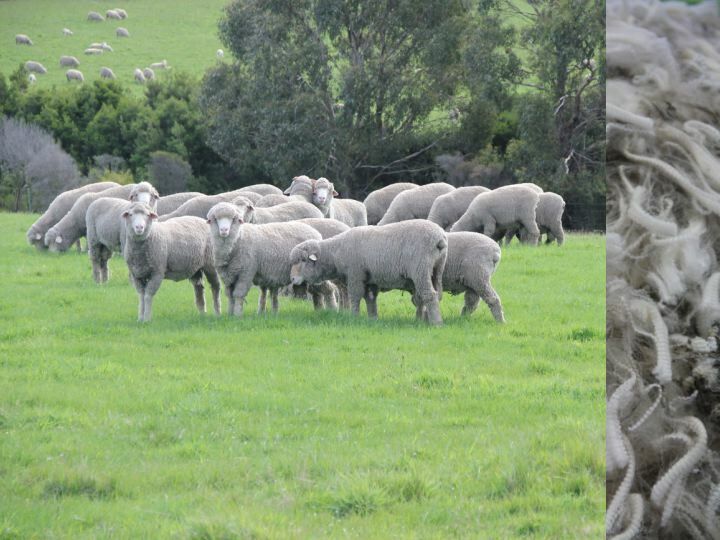 Murrayfireld produces first and second cross white suffolk premium lambs characterised by their intense flavour, tenderness and succulence, due in part to the pristine environment in which they are reared. 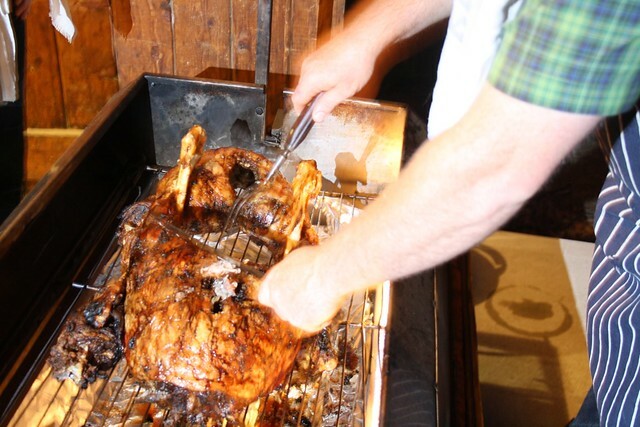 Ross O’Meara carves slow barbequed Murrayfield lamb at Lunawanna (photo by Michelle) on the night of the Bruny Slowjourn dinner. 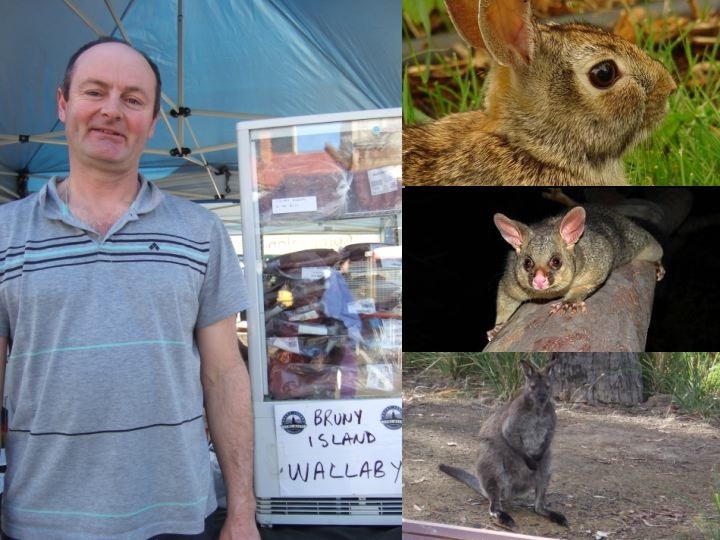 Other meats also served that evening that are unique to Bruny were wild game that Ross and his friend, Richard Clarke have a special license to hunt, in particular the Rufus and Bennetts wallaby, possum, wild rabbit, hare and the occasional pigeon. Clarke runs a licensed game abattoir on Bruny which enables him to prepare the meats properly to sell at the Farm Gate Market and to other outlets around Hobart. 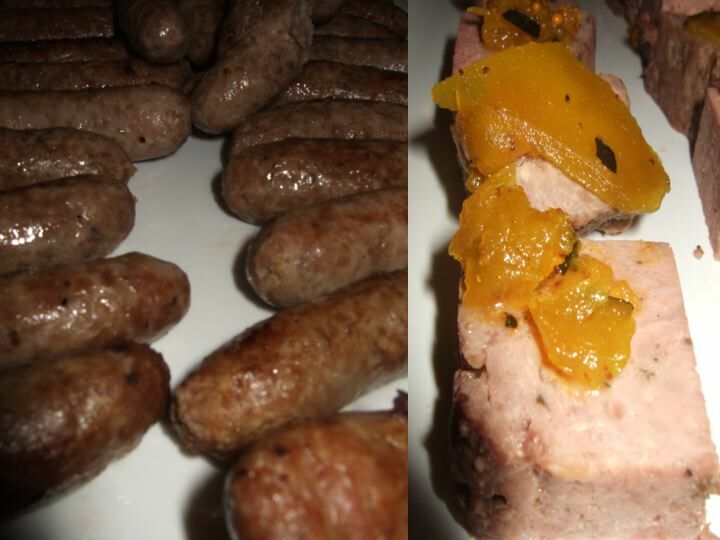 Also on the Slowjourn’s menu was Ross’s boer goat and wild rabbit snags, and wallaby (Bennets and Rufus) and possum terrine with pickled zucchini. 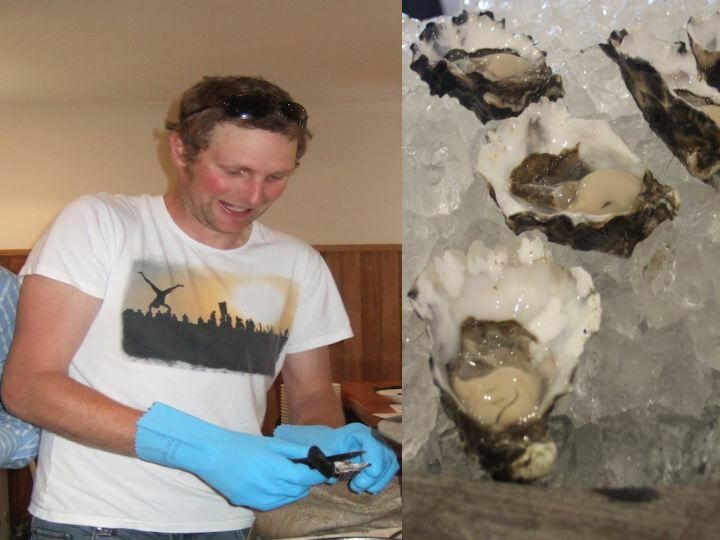 As an entree, Slowjourners were treated to Get Shucked oysters being served that night by Joe Bennett. 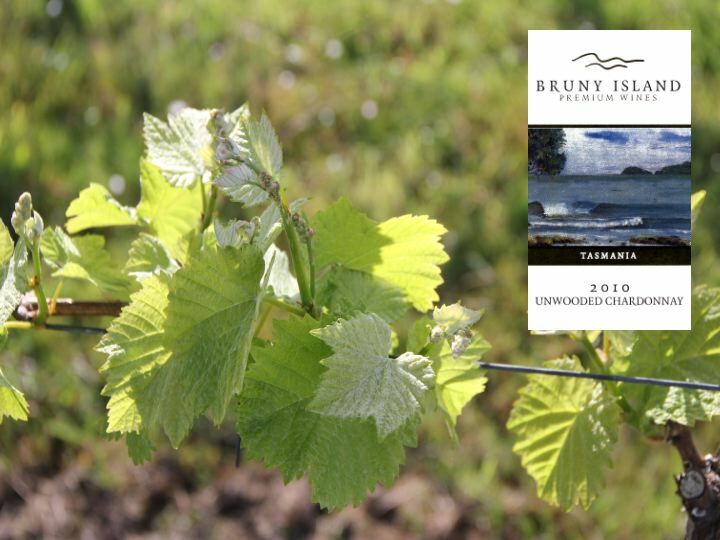 Dinner was washed down by a very nice unwooded Chardonnay produced by Bruny Island Premium Wines, a small family owned and operated vineyard situated just before the township of Lunawanna. 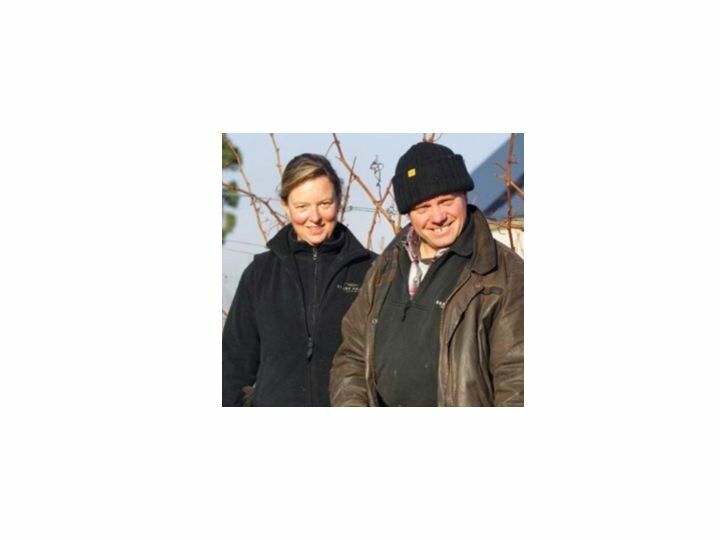 Bernice and Richard Woolley run Bruny Island Premium Wines and their business style very much reflects what it is to be an islander. The farm has been in the family for years, and harvesting the grapes is a communal affair involving friends and family. All aspects of the wine production occurs on the estate, including the wine labels that are based on original paintings by Bernice’s mother. 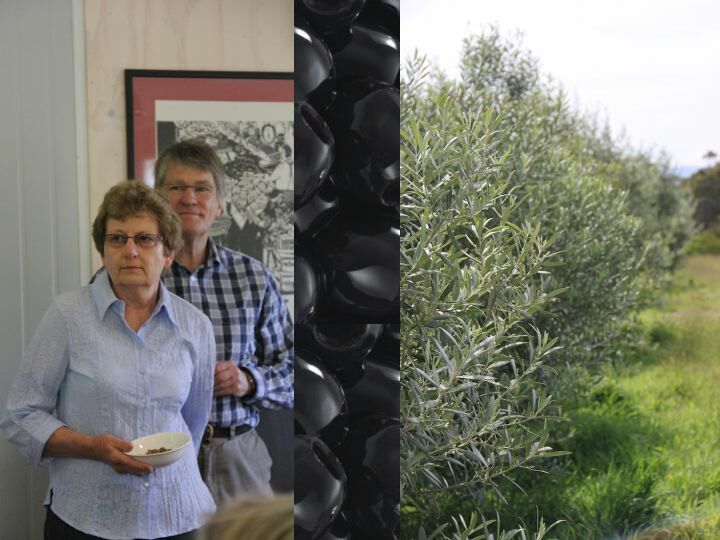 Natalie and Graham Wright harvest Manuka honey (Leptospermum scorparium)…….. – or tea tree as it is more commonly known as)……………. 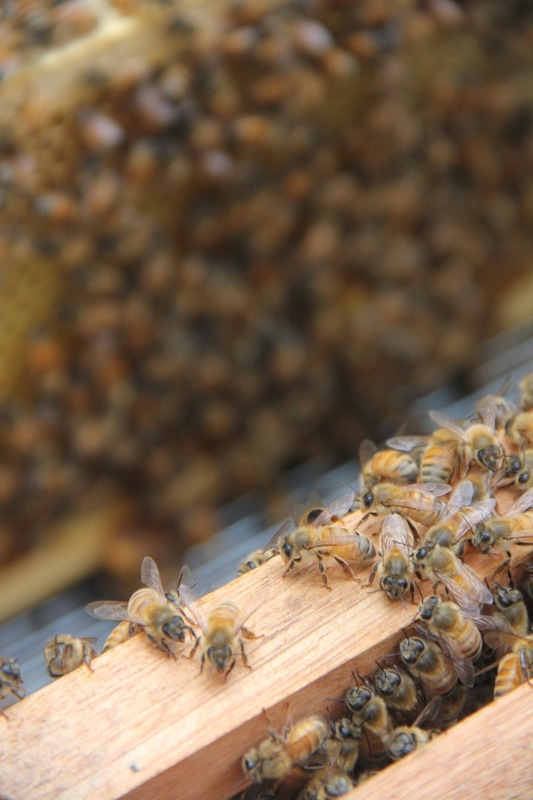 …………from their hives on Bruny Island. 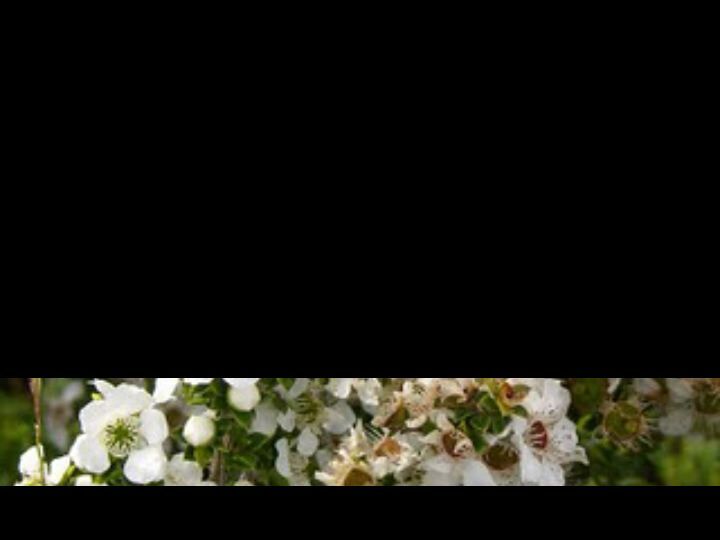 This is a deliciously rich honey that is attributed to having unique medicinal qualities from a naturally occurring non-peroxide property (known as Methylglyoxal) that is found in the Manuka flower. 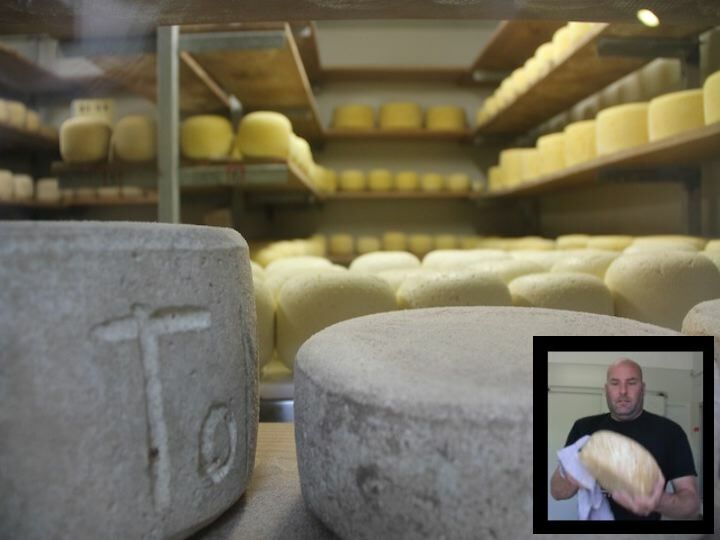 Slowjourners were also treated to gourmet tastings at Nick Haddow’s Bruny Island Cheese Company at Great Bay. 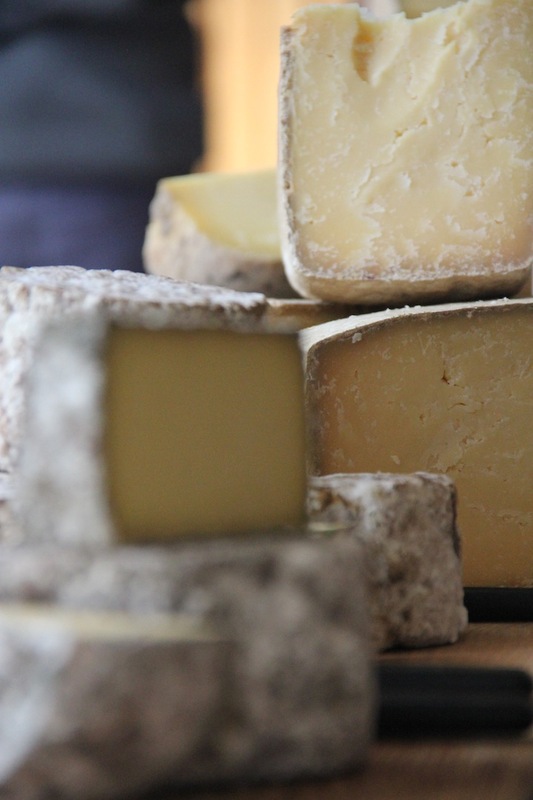 Cheeses with crazy monikers like NANNA (a cow’s milk, semi-hard cheese, matured with a lavender flower and herb rind) and C2 (from the mountainous regions of France and Italy – a cooked curd cheese with a 6-12 months maturity period) were on offer. 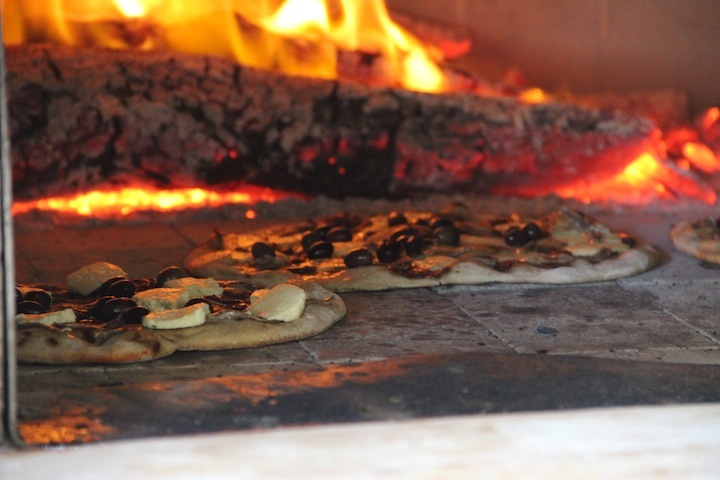 Some of the cheeses made into wood-fired pizzas (by John) incorporating some of the table olives produced by Dianne and Owen Carrington-Smith, whose olive grove is situated just behind the Cheese Factory, comprising of some 90 trees. This is only part of the gourmet story on Bruny – the following posts will continue to tell the stories of fire, food, foraging and cooking with clay. 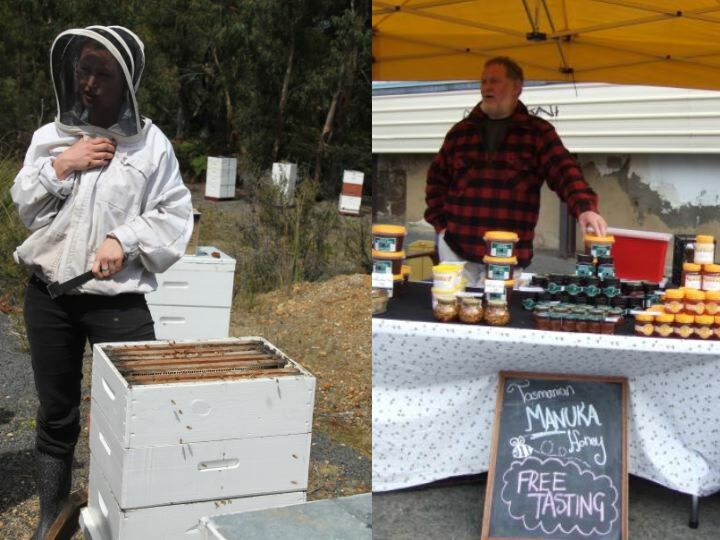 Graham Wright sells his Manuka honey at the Farm Gate Market every Sunday on Melville Street in the centre of Hobart.